Experts say, this era is of social media and why not? With a whopping amount of 2.77 billion social users by the end of 2018, you can actually make up how popular social media is. Due to this enormous figure, social media possess a vast amount of data, and of course, these numbers are growing at an alarming rate. People want to grow their businesses, and therefore the actions and user behavior on social media needs regular monitoring and tracking for getting insights in detail. Now here, Artificial Intelligence (AI) comes into the picture. The main job of AI is to decrypt the data from the real world with the help of cognitive technologies which could understand, predict, and complete the tasks that humans do or have previously done. Though there have been rounds that Artificial Intelligence is going to eliminate jobs, which is true to an extent, yet it is going to create more jobs than it reduces. Be it finding new customers, enhancing existing relations, or doing position branding, social media has become an unavoidable and essential part of any business and influencer. If done effectively, social media management can help in improving a brand’s name and awareness, increase social conversations and engage the users. With the help of AI, it is easy to pick out the trending topics, patterns, and hashtags via which, we can only understand user behavior. AI algorithms can monitor billions of unstructured comments to analyze trends or the critical situations providing a personal experience. Due to its segmentation ability, AI can supply content from online user activity and demographics. Multiple social networking sites are acquiring AI businesses to stay ahead and scale up. Several digital marketing services are finding ways of using social media with AI. They want to target various segments of people from more personal data, demographics, and earlier conversations. The tools of AI rely on an algorithm of predictive analytics; through which we can get various sort of information in that particular social network. Images are one of the effective ways to engage with the audience and let them know about our brand. Images can help in analyzing consumer patterns and their behavior. The AI-powered software is helpful in gathering insights to interpret and gain knowledge on user patterns from billions of images on the social network. We all are aware of the billions of images being posted in a single day, consider the fact that more than 60 million photos are uploaded on Instagram per day! Just imagine the number of images on all the platforms! It is impossible to understand user’s behavior without the help of AI. AI will be becoming smart enough to hunt for different chances for promotions and potential marketing on different platforms. These would generate insights in an accurate manner. AI allows businesses to create a highly personalized user experience through tools like virtual assistants and chatbots. Chatbots are the easiest way to chat with customers and solve their queries. They are becoming sophisticated to create a seamless interaction between brand and customers. Facebook’s initiative to make chatbots which can chat with people and they can book a cab ride is an excellent example of AI use. Many more such projects are coming up, and we will be able to see chatbots more frequently. AI can further prove helpful in deciding what incentive to provide to influencers so that they will take specific actions which we want. It also helps in predicting the performance of influencers according to the goals of the brand. The analysis of their social media posts also proves helpful in marketing the brand. Several social market giants like Twitter, LinkedIn, and Facebook are implementing robust techniques of artificial intelligence for enhancing deep learning competencies. AI has boosted innovations in several related fields. AI is transforming the methods of using big data for social media. Even startups are in favor of artificial intelligence, and the big giants are hiring companies to increase and improvise their portfolio of services and products. Having more than 2.27 billion monthly users, Facebook is one of the most significant social media networking sites. Currently, Facebook is using AI to mark the posts which reflect depression and suicidal thoughts automatically. It has a more enhanced program by which the human moderators can review 20 times the amount of suicidal posts. After reviewing, Facebook sends the suicide prevention help to twice the number of people. In its initial stage, the systems are developed and deployed in different languages for a more personal touch via Instagram. LinkedIn uses a combination of AI and Machine Learning for most of its products. LinkedIn has around seven million active candidates. It helps in finding the best fit for the role. With the help of algorithms, LinkedIn highlights the candidates who are seeking new opportunities and can most likely respond. It has completely transformed its algorithm, fetching 2 million more applications than before. With the use of AI, a recent change made by Twitter is cropping the images through face detection or crafting a thumbnail from a complete image. It is done with the help of neural networks. Twitter can know which part of the image user would want to have. The neural function for cropping pout faces can cut the face in portrait mode, and AI-based function finds out the main parts of the face and brings that in the preview. 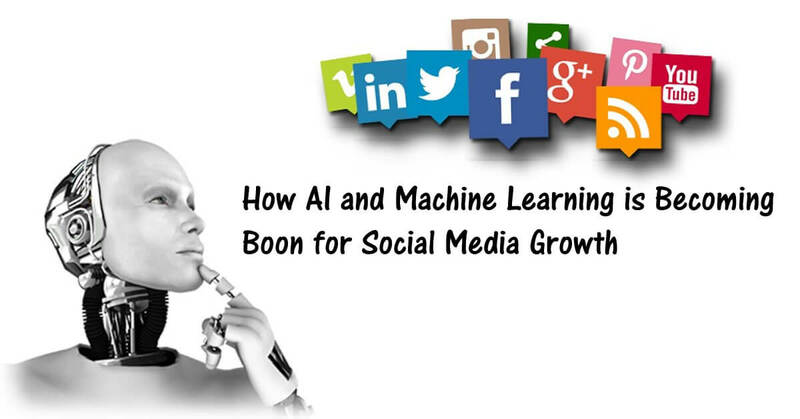 The social media is becoming a big arena for artificial intelligence and machine learning. Although AI can never take the place of human interaction, the fact is that it is playing an essential role in creating a bond. The marketers have to reach out to the customers and develop customers with the help of AI in social media.